The Palestinian prisoners’ movement and its supporters celebrated victory on May 27. A series of concessions by both the Israeli Prison Service and the International Committee of the Red Cross had brought the Strike of Freedom and Dignity, Palestinian political prisoners’ biggest mass hunger strike in five years, to a close after 40 days. As part of the deal, the ICRC, which coordinates family visits to Palestinians in Israeli prisons, will restore the bimonthly service, after cutting visits to most prisoners to one per month a year ago. The IPS will improve prisoners’ education, family visits, food, health care, recreational facilities, telephone access, transportation and overall conditions, the Palestinian Prisoners Affairs Commission director, Issa Qaraqe, said at a press conference in Ramallah. Among other changes, the IPS agreed to lift its ban on visits by over 140 children of prisoners, to install cooling and ventilation systems in prisons, and to give prisoners meals and bathroom access during their transportation between prisons and courts, Qaraqe said. The IPS confirmed an agreement on visitation, but denied it had negotiated with the prisoners. 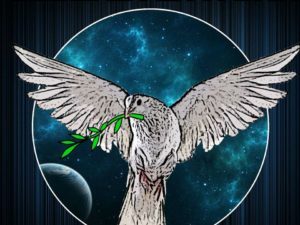 The U.S. Palestinian Community Network said in a statement that the IPS “claims that the agreement was not made with the prisoners themselves, but between Israel, the International Committee of the Red Cross (ICRC) and the Palestinian Authority (PA). Ahmad Sa’adat, the imprisoned general secretary of the Popular Front for the Liberation of Palestine, who joined the strike on May 4, in a statement hailed “the collective fruit of the efforts of the Palestinian people who rallied around the strike. 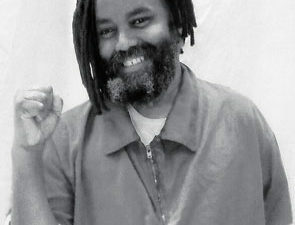 “It came through the support of Arab popular forces throughout the Arab world, and through the support of all of the forces of freedom in the world, including popular movements and organizations, solidarity committees, parliamentarians, social justice movements confronting imperialism and globalization, and the international boycott, divestment and sanctions (BDS) movement,” he wrote from Ramon Prison. After more than 1,500 prisoners led by imprisoned Palestinian parliamentarian Marwan Barghouti launched the strike on April 17, Palestinian Prisoners’ Day, it sparked demonstrations of support both under Israeli occupation and throughout the world. 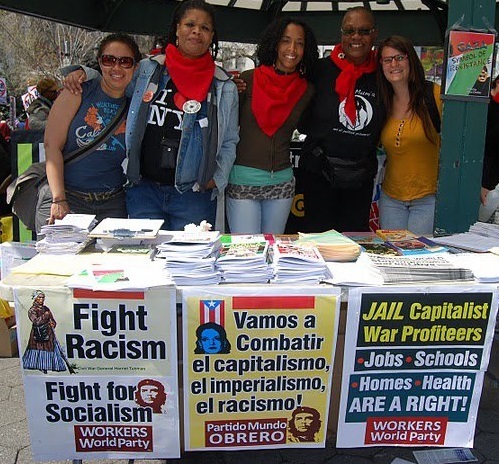 These ranged from weekly protests organized by Samidoun: Palestinian Prisoner Solidarity Network in New York to massive “days of rage” and general strikes across Palestine. Students in Europe and North America, as well as public figures like Melkite Greek Catholic Patriarch Gregory III Laham, Palestinian resistance icon Leila Khaled and Greek Orthodox Archbishop Atallah Hanna, launched fasts in solidarity, while thousands, including 25 at New York City’s Solidarity Center, joined the “saltwater challenge,” a series of videos in support of the prisoners, who drank salt water to stay alive while fasting. Irish Republican political prisoners in Maghaberry Jail and and Filipino political prisoners at Camp Bagong Diwa sent messages of solidarity, with the latter holding a one-day sympathy fast. Inside Palestine, Israeli repression claimed the lives of three Palestinian protesters: 20-year-old Saba Abid, 23-year-old Mutaz Bani Shamsa and 15-year-old Raed Ahmad Radayda, killed by occupation forces and a settler as they demonstrated for the prisoners on May 12, 18 and 23. In the aftermath of the strike, supporters of the prisoners say continued mobilization is crucial, both to secure the gains of the May 27 agreement and to support ongoing and future struggles. “It is important to build forward based on the prisoners’ victory and place the prisoners’ cause as a central issue in our Palestinian, Arab and international struggles for justice in Palestine,” Khaled Barakat, international coordinator of the Campaign to Free Ahmad Sa’adat, told WW. Samidoun in New York will continue its weekly demonstrations in solidarity with the prisoners’ movement, held every Friday at 5:30 p.m. outside the Best Buy store in Union Square. 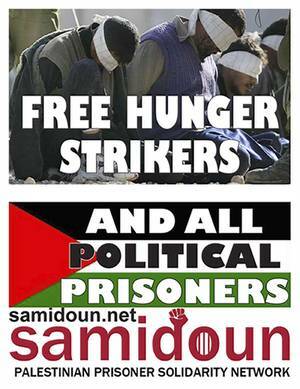 For more announcements of events and activities in support of the prisoners, as well as information on the hunger strike and other Palestinian prison struggles, visit Samidoun’s website at samidoun.net and subscribe to its email newsletter at eepurl.com/XFJr9.